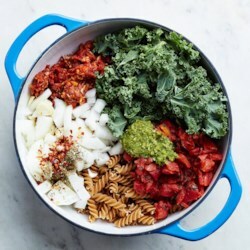 1 Combine pasta, sausage, kale, tomatoes, onion, garlic, pesto, Italian seasoning, salt and crushed red pepper in a large pot. Stir in water. Bring to a boil over high heat. Boil, stirring frequently, until the pasta is cooked and the water has almost evaporated, 10 to 12 minutes. Remove from heat and let stand, stirring occasionally, for 5 minutes. Serve garnished with Parmesan, if desired.